Well my quest to fully furnish my apartment continues. My next purchase will be made out of necessity. My living area currently consists of my TV armoire and my sectional. No tables, nothing. I desperately need a side table. First of all, I need something to sit things on (ie my charging cell phone, picture frames, the remote, etc). Secondly, and more importantly, I need more lighting for late night blogging fests and I need tables to put them on. Now I must choose the perfect table and in true Marche' fashion, I can't decide. I know I want two tables but I don't necessarily want them to match. Here is what I've come up with. I could see any of these working together as a pair. What do you think? 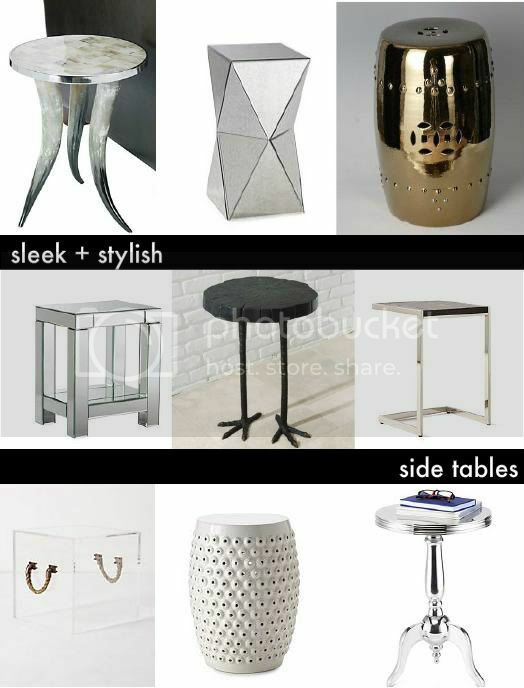 Do you like any of these tables? Which pair would you place together in your space?